United States(US) Senator Lindsey Graham has always taken a keen interest in foreign affairs. That being said, he’s rarely came across a war he did not vote in favour of, as he also supported the US war in Afghanistan. However, on a recent visit to Islamabad, he left stating that Imran Khan – a man who long before becoming Pakistan’s prime minister had repeatedly criticised America’s role in the region – was right all along. These statements from a member of President Donald Trump’s Republican party who is seen to be even more pro-war than Trump, will certainly perk ears in Washington. This is the case not least because many in the US government privately hold negative views on Pakistan’s contributions to the war against terrorism – disparaging views that Trump has somewhat uniquely vocalised in public. Graham stated that far from punishing Pakistan economically, the US should in fact agree to foster more bilateral trade with Pakistan, whilst simultaneously adopting Imran’s long standing position that only an all-parties peace process in Afghanistan (that includes the Taliban) can bring peace to the region. In doing so, Graham has not only rejected Trump’s previous statement that Pakistan has “done nothing” to fight terror, but he has also inadvertently challenged a US establishment of which he himself has long been a part of. Although the US is clearly afraid of losing its influence in Pakistan and in the region more widely, observers of geopolitical trends should not be so naive as to think that the carrot which Graham has dangled in front of Pakistan could somehow erode Pakistan’s all-weather vital friendship with China. The fact of the matter is that Pakistan was able to successfully balance good relations with both China and the US since the 1960’s. If such things could be done when the US was rich and China was poor, it can certainly be done at a time when China is rich and growing richer, whilst America is rich but seemingly reaching a point of gradual decline. Beyond this, by approaching the US from a position of strength and dignity, Imran has sent a firm message to American politicians that they cannot take Pakistan for granted and that likewise, they cannot expect Pakistan to feed American myths regarding Afghanistan, as was largely done by Islamabad’s previous leadership for many decades. 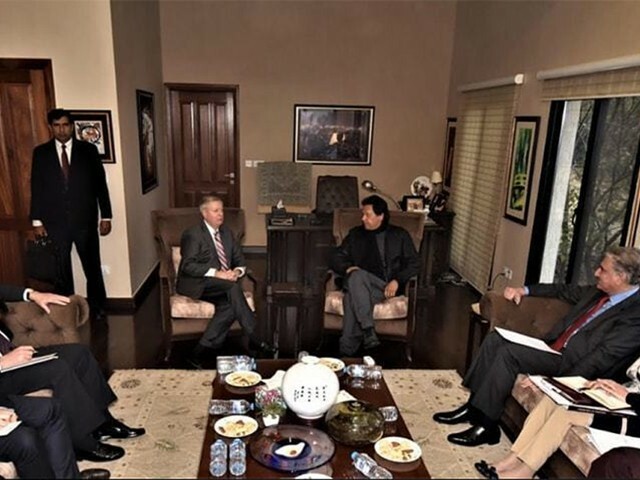 Even before Graham’s meetings with Imran, there were signs that the US was beginning to shift to a more pragmatic method of engagement with Pakistan. Trump’s personal letter to Imran requesting Pakistan’s assistance in bringing stability to the other side of the Durand Line represented a clear departure from both Trump’s previous rhetorical defamation against Pakistan, whilst it also represented a departure from the trend of the Pentagon. Thus, while seemingly optimistic statements by US political officials must be greeting with a sense of caution due to a precedent of Washington saying one thing whilst meaning another, it would be equally foolish to dismiss Graham’s powerful statement outright. The fact of the matter is that Imran has demonstrated to the US that ironing the realities in both Pakistan and Afghanistan is no longer a viable approach to policy-making. Therefore, the US is essentially jumping on the pragmatism bandwagon whilst still trying to secure its own material gain. Ultimately, if Graham’s words are followed by action, not only will Afghan peace be one step closer, but a Pakistan-US free trading agreement would demonstrate that Pakistan’s economic future that China-Pakistan Economic Corridor(CPEC) has largely secured, is substantial enough for even Washington to want to join in with Pakistan’s future rather than spend its own money trying to destroy it.